The Rocky Mountain bighorn sheep is the largest wild sheep in North America and a large ram may weigh over 300 pounds. This herd looks small in context as they enjoy the warmth of the sun with the majesty of snowy mountains as backdrop. 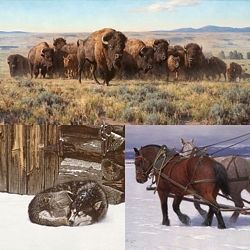 Everything this award-winning artist is known for is here in this composition: the force of weather gathering in the sky, the snow covered peaks, the wildlife in their natural habitat. It’s left for us to observe.